A growing number of consumers are interested in memory foam mattresses, and why not? They bring many comfort benefits, outranking other mattress types on both pain relief and overall satisfaction. But, at the same time, plenty of people also seek healthier homes. This trend demands “greener” products, and options free from health and environmental hazards. One brand that speaks to this intersection of comfort and healthy sleep is Amerisleep, an online mattress company. The Scottsdale, Arizona-based company has been a pioneer in the design of plant-based foam and greener manufacturing since 2007. Amerisleep generally aims to combine comfort and eco-friendly materials with affordability. The brand offers a few models ranging from entry level to higher-end. Their Amerisleep Colonial Bed, the model reviewed in this article, seeks to appeal to people interested in luxury. The Colonial uses plant-based foams and high-tech materials designed to compete with the likes of Tempurpedic and iComfort. However, with greater emphasis and greener manufacturing and more attractive value. 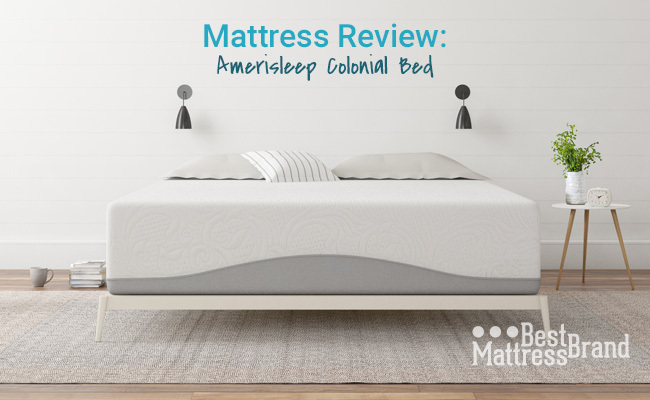 Read on to see our detailed Amerisleep Colonial Bed review and comparison. Want to the verdict right away? skip down and read our review highlights. How Does Amerisleep Stack Up Against the Competition? We’ve previously reviewed this brand as a whole before. But, the make up of the Colonial model differs a little from other models Amerisleep offers. This one inhabits the higher-end range and incorporates different, more advanced foams than the entry-level options. Inside, it contains three separate foam layers and a unique Celliant-based mattress cover. 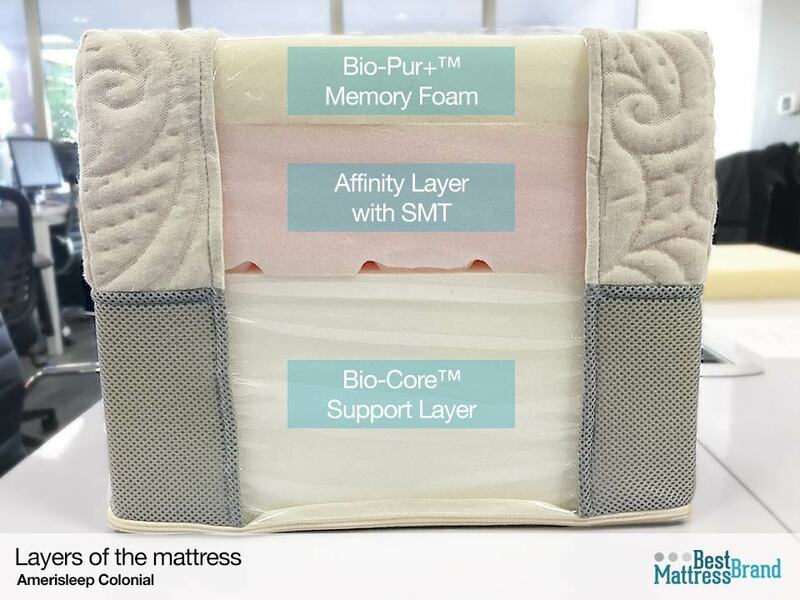 Amerisleep’s proprietary BioPur+, their ‘most advanced’ memory foam, makes up the top layer. A highly responsive, almost instantaneous “bounceback” to its uncompressed form sets this foam apart. Responsive describes a lack of “smothering” or “being stuck”, sometimes a trait of traditional foams. The two inches of BioPur+ foam also feature a larger cell structure for better airflow. As a result, sleepers enjoy better cooling than even traditional plant-based memory foam (already known to dissipate heat faster than gel foam). The next layer is comprised of four inches of “Affinity” foam to provide an active response layer with the goal of providing plushness. This layer also serves to prevent sinking, which can be an issue in some beds with thick layers of soft memory foam. It uses a technique termed Surface Modification Technology (SMT). This creates zoned channels on the underside of the layer to improve airflow, breathability, and pressure distribution. Finally, Amerisleep’s Bio-Core high-density foam comrises the bottom layer. This serves as the base layer, to provide a supportive and responsive foundation for the memory foam. This create the overall “feel” of a softer initial surface, but with firm underlying support. A Greenguard-certified fire sock wraps the foam layers to provide fire safety as required by law. Using fiber barrier that’s certified to be free of harmful chemicals further reduces chemical emissions compared to traditional foams. Other beds utilize chemical flame retardants and other treatments that may emit Volatile Organic Compounds (VOCs), which concerns some buyers. 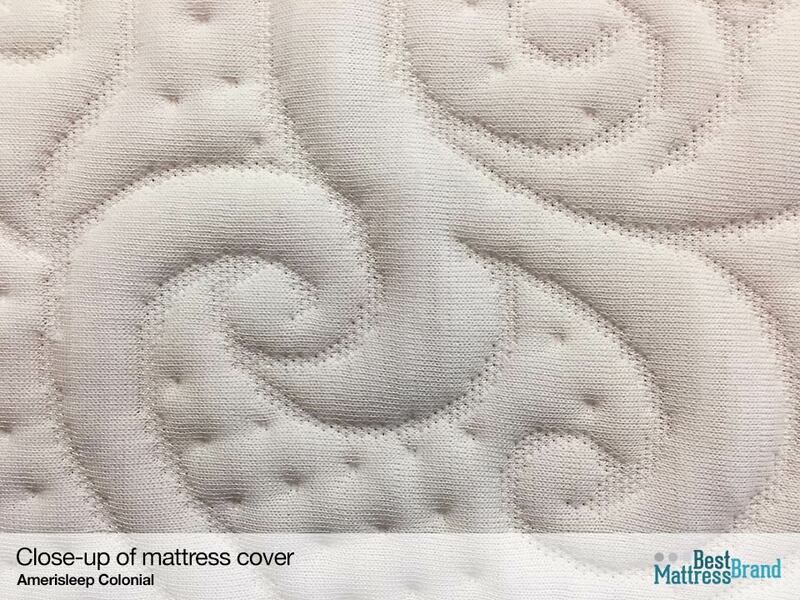 This mattress also comes with a removable, washable Celliant cover. The “smart fabric” contains thermo-reactive mineral fibers which transform body heat into non-visible infrared light. This type of light increases blood flow and reduces pain. In clinical studies by the material’s manufacturer, results show it helps people fall asleep 15 minutes faster and stay asleep longer during the night. Amerisleep’s plant-based mattresses consistently receive customer satisfaction ratings that are above average. In general, memory foam mattresses average an 80% positivity rating in customer reviews. Amerisleep’s beds average 90% positive or higher. Amerisleep Colonial reviews average 4.6 / 5 stars from over 130 owners. 99% of owners of the Colonial model would recommend it to others. Mentions of improved sleep, reduced pain, good value compared to other well-known brands, support and durability pop up frequently in comments. Customer reviews provided on the Amerisleep website work through a third-party verified system. Using independent verification shows good business practice and indicates transparency in an industry that can be tricky to navigate. In terms of negative comments, Amerisleep does much better than their competition. Fewer than 2% of reviews complain about sagging or “sleeping too hot,” and fewer than 3% mention odors or off-gassing. Opposite a category average of 7-12% heat complaints and 12% odor complaints, this appears markedly low. Some reviewers experienced issues with delivery, for example, that bed frames ordered from Amerisleep took longer to be delivered than the mattress itself, but these were the exception and not the norm. As a brand, Amerisleep promotes a few additional aspects, including simple delivery, a trial period, and an extended warranty. Purchasing couldn’t be any easier, because everything happens online, with delivery straight to your house via FedEx usually in less than a week. The compressed size makes delivery quicker and enables buyers to fit the new bed through tight hallways, doors and stairs. This also reduces the carbon emissions required compared to shipping a full-sized bed via freight. Memory foam “remembers” its original uncompressed shape and size. This means the mattress can be rolled into a compressed form that is light and easy to handle. The Amerisleep mattress is then unrolled onto the bed frame or base once received. Ideally, you leave it to “breathe” for several hours while it regains its original shape. Buying a new bed online without experiencing it can be intimidating. To ensure customer satisfaction with the purchase, the company offers a “Rest Without Risk” policy. This allows customers to try the bed in their home for 100 nights. Amerisleep will give a full refund to anyone who is not satisfied. They’ll even help find a local place to donate the bed so that it doesn’t have to be returned to the place of purchase. It’s difficult to even imagine a more risk-free way to buy a high-quality mattress. Even local stores typically charge restocking fees and require you to truck the bed back to them. Buying a mattress, especially online, can be extremely nerve-racking. A five minute test-drive in the store is nothing like sleeping on a bed at night. You need at least 30 nights to get used to your bed and see if you’ll like it. Amerisleep has changed the industry by giving customers a 100 night trial period and free returns for all of their mattresses. Finally, Amerisleep guarantees their products with a 20-year warranty. Ten years of full replacement coverage extend throughout the typical lifespan of a memory foam bed. This timeframe proves identical to the warranty you find from Tempurpedic and other similar high-end beds. The additional 10 years of pro-rated coverage make the warranty about twice as long as the warranty for most other competing mattress brands. Among high-end bedding products, memory foam mattresses are generally rated higher in terms of comfort than innersprings. However, in the early days of foam mattress construction, this comfort came with a significant drawback. The foam used in most furniture and mattresses is petroleum-based. This means that not only does the manufacturing process pollute the environment, the finished mattresses themselves consequently contained pollutants and released gases and odors that many users found to be unpleasant, or deleterious to their health. Some of these like CFCs and PBDEs have been banned, but many foams still contain VOCs that get expelled into the atmosphere and your indoor air. Amerisleep changed all of that by pioneering the use of plant-based memory foam to produce materials that are remarkably free of odors and off-gassing. Some 40% of Amerisleep’s proprietary material is made from caster- or soy-based materials. In addition, Amerisleep’s Variable Pressure Foaming (VPF) manufacturing processes prove more environmentally friendly than those used by other foam producers. VPF emits zero emissions into the atmosphere, because its design creates the foam within a closed chamber. The chamber then sends the air leaving the chamber through carbon filters that scrub it of harmful chemicals. Most notably, this makes it even cleaner than when it entered the chamber. The VPF process not only exceeds the requirements of the Clean Air Act, it produces a foam that is remarkably free of Volatile Organic Compounds (VOCs), and that has an “open cell” structure that improves breathability. Choosing foams with low or non-detectable VOCs keeps your family healthier, and responsible manufacturing ensures that plant stays healthy as well. Comparable prices for a 12-13-inch plush mattress from competitors average twice the price of the Amerisleep Colonial bed. Furthermore, those competing brands don’t claim the additional eco-friendly features. In addition, Amerisleep Colonial Bed reviews tend to show satisfaction higher than more expensive counterparts, with fewer complaints of service and product issues — making it seem like an all around good value. Share in the comments if you have any questions on Amerisleep reviews or other beds. What would the place of full sizes? I am struggling on what bed to get. I have narrowed it down to Amerisleep. My wife is 5’6 and 140lbs while i am 5’11 and 190lbs. She is a side sleeper while i sleep on my stomach. My wife also has arthritis so I know she needs a softer mattress that is supportive. I really like the Amerisleep Colonial but it has a higher price take compared to the Liberty. Do you think the price of the colonial is worth it? Would it be to soft for me as a stomach sleeper? Should i just go with the Liberty? My wife a 125 lbs. side sleeper, thought the Liberty was too hard. We contacted Amerisleep and they are sending us a comfort topper no charge which should make it softer. Great service people! I would suggest getting the Colonial. The Liberty is even a little too hard for me. I’m 6′ and 190 lbs.